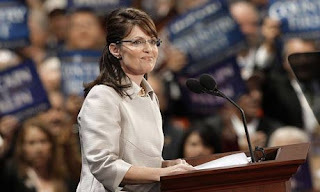 I'm not really one for politics but I just spent the last hour or so watching news clips of Sarah Palin in interviews ans giving speeches and such, and I must say that THIS WOMAN FREAKS ME OUT. The thought of her in a position of power anywhere, Alaska or Washington D.C., makes me deeply uncomfortable. Listen to her explain herself and her political intentions and see what crosses your mind. Yes, she's quite scary. But this country's voters seem pretty excited about the possibility of having a hot mom as v.p. plus, she does not like polar bears. the future is bleak. how could you not like polar bears? Waynedici, if I did not already love you, this would seal the deal. I think the only woman scarier than her is McCain's wife. Have you seen here Satan eyes? It's like she's about to shoot a laser out of them and blow the world up.